​IN FALL 2015. SEE THE MOU FOR DETAILS. Determining the teaching power of your department can be very confusing. 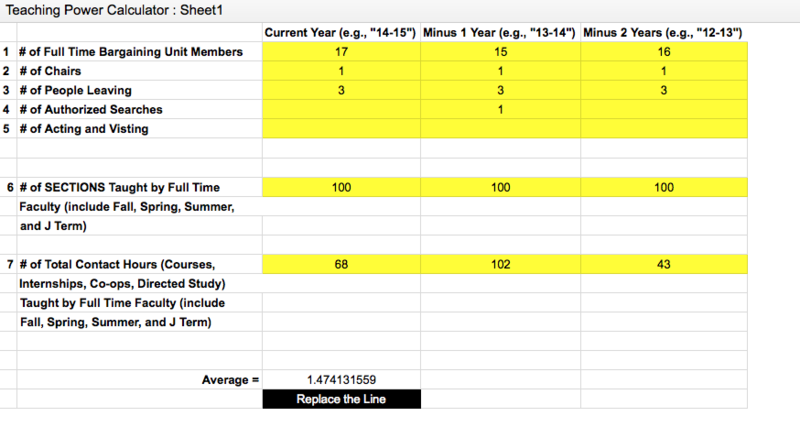 This simple calculator will help you determine whether your department's current teaching power merits an additional faculty line. First, download the calculator (it's an Excel file). 1) Enter the information only in the yellow blocks for the current year and each two previous years. If you had 17 bargaining unit members in your department in 2014-2015, simply enter "17." If you had 15 in 2013-2014 and 16 the previous year, enter that information. 2) Enter the number of chairs in your department for each year. This should always be 1. 3) Enter the number of people who are leaving for each year. In the example below, three good people left every year for three years. 4) If there are any authorized searches, you'd include the number of searches. If there are no searches, you can enter "0" or simply leave it blank. In the example below, the Provost one authorized one search in the past three years for the department. 5) If the department has any acting or visiting lines, enter that number or simply leave it blank. There are no acting or visiting lines in the example below. For the example below, the department offered 100 sections every year for three years. Odds are the numbers will vary from year to year but are probably pretty close to one another. 7. Enter the Number of Contact Hours (make sure you do not count what was entered in # of sections). The total number of contact hours will vary per year for your department. From these numbers and calculations, there is a ratio. If the result is 1.3 or higher, you can request a new line. If the result is 1.29 or lower, the Provost is not required to authorize a search. But you can try. a) You take the number of Full Time BUMs and multiply that by 18.
b) You take the number of chairs and multiply that by 12.
c) You take the number of authorized searches and multiply that by 18.
e) Add a, b, c, & d together gives you the FT-TP before sepearation. a) You take the number of people leaving and multiple that number by 18.
b) You subtract that amount from the FT-TP before seperation 1(e). a) Take the total number of sections (including Fall, Spring, J-Term, Summer) and multiply that by 3.
c) do that for the current year and the each of the precedding two years. a) For each year, take 3(c) and divide that by 2(b). b) Once you have the ratio for three years, average them together. c) If the average is 1.3 or higher, replace the line. If the average is 1.29 or lower, don't replace the line.